We have updated our DeckStainhelp.com site with numerous new reviews and articles for 2018 on deck cleaning products and how to tips. We strive to remain your number one deck stain information source. Please ask any questions below that you may have in our comment area. Exterior wood decking when left neglected oxidizes from the Ultra Violet rays from the sun. This will patina the exposed layer of wood cells turning the deck gray. Cleaning the deck first will a deck cleaner will remove this layer of graying wood cells while removing accumulated dirt, grime, mold, mildew, and algae. Prepping your wood deck is the singular most important step when it comes to getting maximum performance out of your deck stain. Failure to prep and your stain will fail faster than it should and will not give the wood it’s natural beauty. This article will go over the needed steps to properly clean your deck prior to applying the stain. Here at DeckStainHelp.com, we take pride in the fact that we have become the Internet’s go-to source for all things exterior wood and deck restoration related. 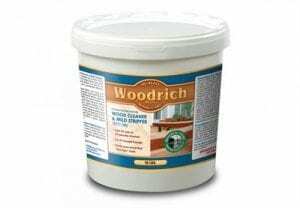 Since we’ve published this article, we have received some input on the best deck cleaner to use on wood decks. 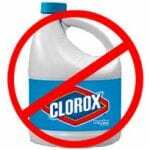 Like before, we do not recommend cleaners with bleach. Instead, opt for a high-quality cleaner without bleach. We always appreciate your input, so feel free to leave a comment below with pictures of your deck stain projects. Bleach and Wood Decks. Is it a good idea? 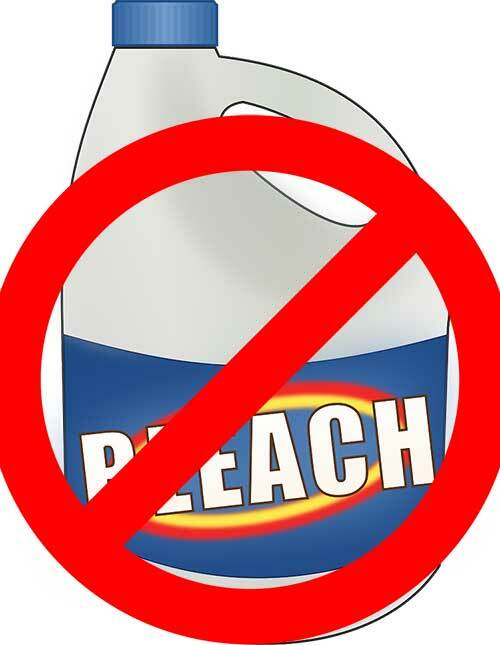 There is a lot of debate as to whether or not bleach or bleach-based products can be used to clean a wood deck. 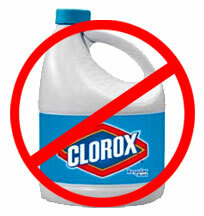 After all, bleach is cheap and readily available and has always been known as a household cleaner. To better understand this dilemma, let’s take a look at what bleach is. Please read this article and post any questions you have in the comment are below. Our newly enhanced website now offers the ability to upload and post pictures of your exterior wood or deck. 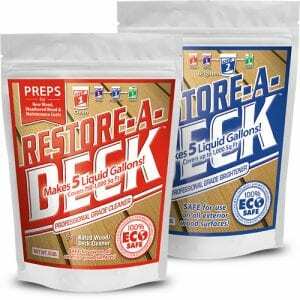 This will help us determine the proper prep for your deck using the Restore-A-Deck Cleaner and Wood Brightener Kits. Below you will see a YouTube Video Review of the Restore A Deck Prepping kit. This is from an actual consumer and is very informative and helpful. 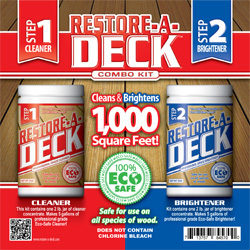 Restore-A-Deck is the only product on the market that offers both a Step 1 Deck Cleaner and a Step 2 Deck Brightener in the same kit. 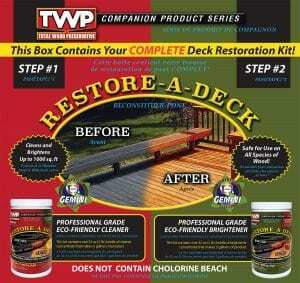 Restore-A-Deck comes in a powdered concentrated formula. Each 2 lb container makes 5 liquid gallons. Simply pour each into a five-gallon container and add water to dissolve the powder concentrate. – The Restore-A-Deck Step 1 Deck Cleaner did very well at removing general dirt and grime. The deep cleaning formula made it easy to break down the gray wood cells. All mold was removed as well. The Step 1 Deck Cleaner did not remove some rust stains from the furniture but the Step 2 Brightener did. – The best on the market today. The cost to clean and brighten an average 600 square foot deck is less than $.07 a foot. Since Restore-A-Deck comes in a powder we liked that you only needed to mix as much as you needed. Very little waste. Should You Stain a Deck Without Cleaning First? The correct answer is – not if you want the deck stain to last as long as it should. The number one reason a deck stain fails prematurely is because the wood surface was not prepped correctly. Even a high-quality deck stain will not be as effective or protect like it should if the wood deck was not been washed first using the right deck cleaners. 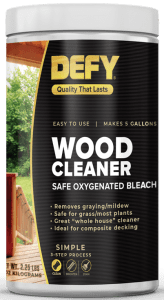 A good deck cleaner should be used to remove gray wood fibers, dirt, mold, mildew, and other pollutants that are deep down in the wood. 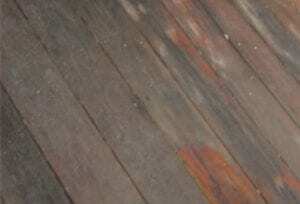 In some instances, a deck stain stripping agent is required to remove an old failing deck stain. It’s vitally important to remove all remnants of an old deck stain so the new stain can penetrate the wood. More times than not, most deck stains will not adhere to each other. When a deck stain is applied over an old failing stain it will start flaking and peeling within a year or so making an even bigger mess. EFC-38’s unique formulation provides the strength necessary to clean gray wood, mold, mildew and heavy accumulations of grime. EFC-38 contains sodium percarbonate and additional surfactants that boost the overall effectiveness. 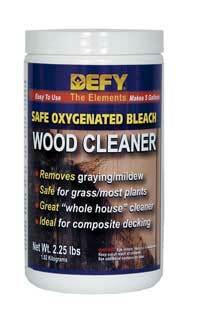 EFC-38 was designed to clean and prep all exterior wood. EFC-38 is safe to use and makes an excellent tool for wood preparation prior to applying a wood coating. – EFC-38 is very effective at removing graying wood cells and algae. The wood surface looked 90% or better when done with the cleaning. All algae and mold were removed from the fence. We appreciate you visiting Deckstainhelp.com as we continue to be your go-to source for the latest in deck restoration news and trending topics through 2019. Below, we talk about Deck Cleaning Tips. Feel free to leave a comment below with any pictures you may have. Wood restoration can be one of the most misunderstood services and one of the toughest for do-it-yourself homeowners. One thing to keep in mind is that the main reason a new deck sealer will fail prematurely is that the wood was not cleaned properly beforehand. When wood becomes weathered, it needs to be cleaned prior to sealing. Cleaning a wooden deck can be a difficult task for a homeowner that is uneducated about the process. Using a pressure washer can be an effective method. You must also use the proper cleaners to get the dirt and grime out that is deep down in the wood. Most people make the mistake of using too much water pressure when using a pressure washer. Wood is actually pretty soft and can damage easily from excessive water pressure. Cabot® Ready-to-Use Problem Solver® Wood Cleaner is specially formulated to remove mildew stains, mold, algae, dirt and other foreign matter from all painted, stained, unfinished or weathered wood surfaces. Use for routine cleaning and for properly preparing all surfaces prior to staining or painting. – Cabot Problem Solver Wood Cleaner is a sodium hypochlorite “bleach” based cleaner. It removed the mold but did a poor job of removing the graying and dirt. – In general, we are not fans of liquid-based wood cleaners. You are mostly paying for water in a bottle with a small amount of chemicals added. It is much more cost effective to purchase a powdered cleaner. Cabot Problem Solver Wood Cleaner is fair price for a liquid deck cleaner. BEHR Premium 2-In-1 Deck Cleaner is a cleaner specifically formulated to clean and brighten wood surfaces as well as remove mildew stains. This unique product will also remove tannin bleed, red clay stains, rust stains on wood and masonry, and clean vinyl/aluminum siding, composite decks and more! 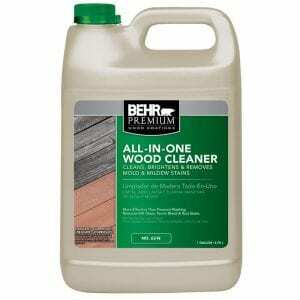 – The BEHR Premium 2-In-1 Deck Cleaner did a poor job of cleaning and removing the graying. The cleaner did not remove any of the mold or mildew from the wood. It did lighten the color of the wood slightly. On inspection of the contents, it was determined that this product is more of a wood brightener than a wood cleaner. Contains oxalic acid and a soap additive. – Cheap for a liquid deck cleaner but since it does not work very well we could not give it a high rating here. Wolman™ DeckBrite Wood Cleaner is an oxygen powered wood cleaner used to clean and restore decks and other weathered wood. When mixed with water, DeckBrite quickly and safely restores dirty, weathered-gray, mildew and algae-stained wood to its bright, natural, like-new look. DeckBrite is used to prep for reapplication of wood stains as well. 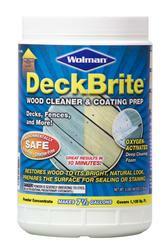 – Wolman™ DeckBrite cleans and removes grayed wood very effectively. We prefer oxygenated based wood cleaners and the DeckBrite performs as we would expect. – Excellent! Powdered deck cleaners are hard to beat when it comes to cost.